The authors describe the fact that consumers are confused about the relationship between fuel economy (miles per gallon) and fuel consumption (gallons per mile), which leads to inaccurate assessments of the value of fuel economy. Another apparent source of confusion is a consequence of reporting fuel economy in miles per gallon rather than fuel consumption in gallons per 100 miles. Research has shown that many consumers perceive the value of an increase in 10 MPG from 40 to 50 MPG to be equal to a 10 MPG increase from 20 to 30 MPG. In fact, the increase from 40 to 50 MPG reduces fuel consumption by 0.50 gallons per 100 miles while an increase from 20 to 30 reduces fuel consumption by 1.67 gallons per 100 miles. For a vehicle traveling 10,000 miles and gasoline at $2.50 per gallon, the difference in annual fuel savings is almost $300. The fueleconomy.gov website provides the option to view fuel economy estimates in terms of miles per gallon, gallons per 100 miles or liters per 100 kilometers. However, this facility is little used by visitors to the website. Additional market research may lead to better strategies for helping consumers understand this important distinction. We agree that consumers will generally not select "gallons per 100 miles" on their own--although some may have heard about the problems with MPG comparisons, the vast majority have not. First, there are two things that the EPA and DOE do not need to do. 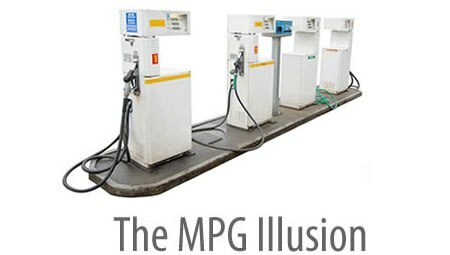 First, you do not need to explain the MPG Illusion to car buyers, which may not be of interest to many consumers. Second, you do not need to use the acronym “GPM,” which may strike some consumers as unnecessary. 1) Emphasize clearly on the opening page of the fueleconomy.gov website (and in the Fuel Economy Guide) that consumers should compare the gas consumption of cars, not MPG. Almost all consumers will care about gas consumption. It needs no further justification. 2) Provide consumers with a salient, immediate measure of gas consumption when they examine cars. The measure could be gallons per 100 miles or gallons per 10,000 miles. It could be displayed as a column of data in the Fuel Economy Guide and could be exhibited next to MPG in the car comparison windows on the fueleconomy.gov. Both USA Today and Popular Mechanics have started using the "gallons per 100 miles" measure. Currently fueleconomy.gov offers a "gallons per 25 miles" measure automatically (see below). The logic for choosing this distance is that it is a typical daily drive. Jack Soll and Dan Feiler have pointed out that this number may be useful for daily driving decisions (whether to make a trip or not). The problem with this measure, however, is at the time of the car purchase decision. It makes all gas consumption numbers look small and similar (.5 vs .64 vs 1.04). At the time of a car purchase, a longer distance is more realistic and makes differences between cars clearer. 2) make buyers more sensitive to the benefits of fuel savings (compared to gallons per 25 miles).